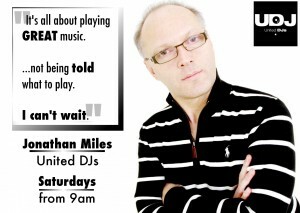 United DJs is all about handing control back to music loving DJs and is about allowing Dj’s to be themselves. Radio around the world has become ‘all about the money and the brand’ which is important, bu t, as a result radio has lost its spontaneity and its vibrancy. Dj’s are a special breed, and have a particular talent, and UDJ’s is bringing them back from the statistical wasteland. For so long it’s all been all about studies and music and market surveys, all based on mathematical calculations by bean counters, and those ‘ counters’ have ripped the very essence out of personality radio. Radio until now lost its soul. For so long presenters have been told to ‘shut up & play the music’, well, ‘put your iPod on and listen to that if you only want music. UDJ’s has a humongous playlist, not just 10 records on repeat, so welcome to entertainment value, a friendly voice and to United DJs bringing the wall down – indeed welcome to the next revolution in radio – UDJ.